Arx Mortis is the LARGEST and MOST INTENSE haunted attraction in North Alabama! .....And visit us AGAIN on Halloween night to experience the attraction by candle light! We like to think of Arx Mortis as more of a haunted experience than just an attraction. We have been hard at work creating new and twisted places for you to enjoy. And as always, we have made every effort to bring you the best haunted entertainment possible, incorporating professional animatronics, actors, make-up and sets. Arx Mortis is a 50,000 square foot haunted attraction that features movie quality special effects, animatronics, and sound, as well as a huge cast of LIVE MONSTERS. The self guided tour takes approximately 30 minutes to complete and ends in the Keeper's Korner gift shop. The Hill is back! Add the Hill upgrade to the main attraction and you'll start your tour by navigating through a dark, winding, haunted trail deep in the woods behind Covington Clinic. The nine sovereigns have infiltrated the woods and are lying in wait for you - you'd better find them before they find YOU! (Halloween Night) from 7-11 pm, all of the lights inside the main attraction WILL BE OFF! Each group is assigned a small, weak, and unreliable flashlight to guide them through the twists and turns of ARX MORTIS! North Alabama's first interactive laser tag! Grab your friends, lock and load, and take on the ZOMBIES in a fight to the death. Do you have what it takes to make it out alive? Open each Friday & Satuday. You and your group have been infected! You have just 5 minutes to find the antidote and escape before the security system vaporizes you (in order to save the human race from more "biters"). We know your time is precious and we strive to move the crowds quickly into and through the haunt, but long waits are an inevitability with this type of entertainment. What we will not do is sacrifice the show just to squeeze a few more people through! That being said, we have made every effort to make your wait as pleasurable as possible. Arx Mortis uses a “group” system to get you into the haunt, instead of making you wait in one huge line (that you can’t leave for fear of losing your spot!). After purchasing your ticket, the group system leaves you free to roam about and enjoy our expanded waiting area, concessions, and gift shop until your group has been called up to the queue line. We have a warning signal that can be heard throughout our facility, alerting our guests that we are about to call up the next group - so just enjoy yourself and relax while you wait. While you wait, have your photo taken our photo area "Shutter Up" (to the right of the concessions area). Remember the night you survived the horrifying fun with your friends for years to come! The Arx Mortis gift shop, Keeper's Korner, is located in the front of the building, and will be selling Arx Mortis themed items, T-shirts, and a variety of other horror paraphernalia. Don’t forget to grab a bite to eat from the Killen Town Cafe. Pizza, drinks, coffee, and hot chocolate will be served nightly from open ‘til close. Bring printed E-ticket OR show ticket on smartphone for admission (we will need to scan the QR code). Enter the Online Ticket queue line. Arx Mortis is rated PG 13 due to INTENSITY, REALISM, and GORE - enter at your own risk. The Box Office opens at 7pm each night Arx Mortis is open. Attraction begins at 7:30 pm. Fridays, Saturdays, and Halloween are the busiest nights, so you should expect longer wait times on those days. Optional upgraded ticket that offers faster access to the haunted house. There is a separate queue line to the Online ticketing window where you will present your e-ticket in exchange for a Fastpass to Arx Mortis. 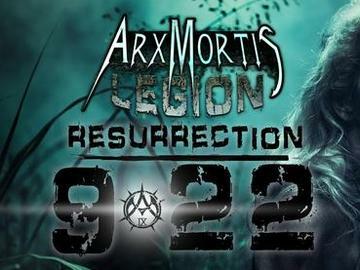 General Admission tickets for Arx Mortis can be upgraded to Fast Pass at the Online Ticket Window.